Activists and social change agents, restorative justice practitioners, faith leaders, and anybody engaged in social progress and shifting society will find this mindful approach to nonviolent action indispensable. Nonviolence was once considered the highest form of activism and radical change. And yet its basic truth, its restorative power, has been forgotten. In Healing Resistance, leading Kingian Nonviolence trainer Kazu Haga blazingly reclaims the energy and assertiveness of nonviolent practice (utilized by the Women's March and Black Lives Matter), and proves that nonviolent civil resistance remains the most effective strategy for social change in hostile times. With over 20 years of experience practicing and teaching Kingian Nonviolence, Haga offers us the practical approach to societal conflict first begun by Dr. Martin Luther King Jr. during the Civil Rights Movement, which has been developed into a fully workable, step-by-step training and deeply transformative philosophy. Kingian Nonviolence takes on the timely issues of endless protest and activist burnout, and presents tried-and-tested strategies for staying resilient, creating equity, and restoring peace. 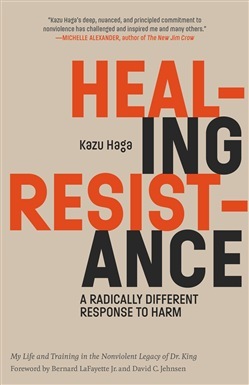 Acquista Healing Resistance in Epub: dopo aver letto l’ebook Healing Resistance di Kazu Haga ti invitiamo a lasciarci una Recensione qui sotto: sarà utile agli utenti che non abbiano ancora letto questo libro e che vogliano avere delle opinioni altrui. L’opinione su di un libro è molto soggettiva e per questo leggere eventuali recensioni negative non ci dovrà frenare dall’acquisto, anzi dovrà spingerci ad acquistare il libro in fretta per poter dire la nostra ed eventualmente smentire quanto commentato da altri, contribuendo ad arricchire più possibile i commenti e dare sempre più spunti di confronto al pubblico online.